Sun., Nov. 6, 2016, 11 p.m.
As the final Northern Arizona penalty kick sailed over the crossbar Sunday afternoon, Eastern Washington goalkeeper Mallory Taylor raised her hands in celebration, ran onto the field – and promptly disappeared. 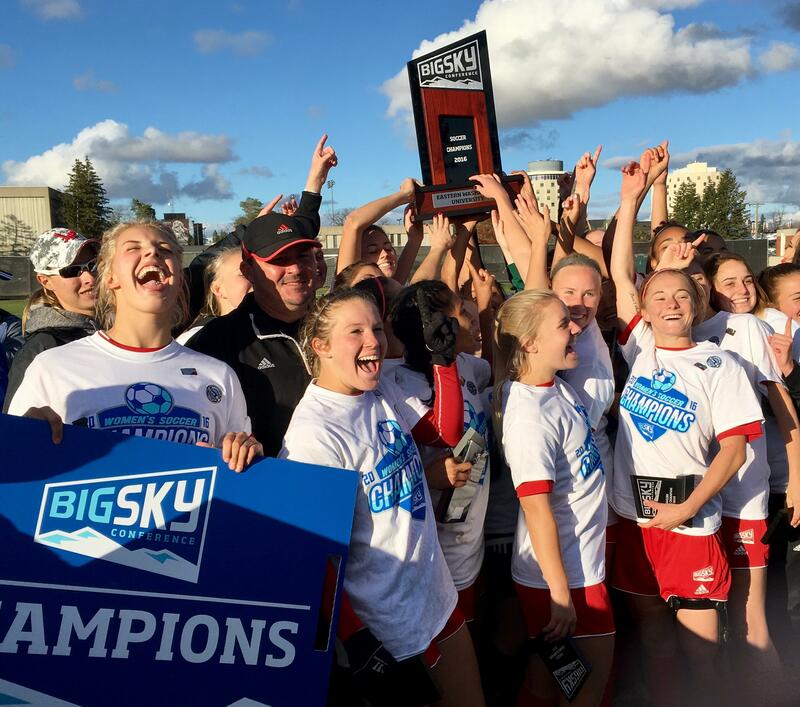 Taylor was buried by her red-and-black-clad teammates, who in turn were mobbed by several dozen football players and other fans as the Eagles celebrated the first Big Sky Conference soccer title in school history. “We’re still playing, baby,” coach Chad Bodnar roared on the field after the Eagles outlasted Northern Arizona 2-1 in Cheney after a penalty kick shootout to qualify for the NCAA Tournament. Next up: the NCAA College Cup. Pairings will be announced Monday afternoon. “I guarantee you, we’ll be playing somebody really good,” Bodnar said. That didn’t matter Sunday afternoon, as the clouds finally parted to give Eagles soccer its place in the sun. “It’s just a surreal feeling, having family and friends here and making school history,” Eastern forward Chloe Williams said. Indeed, the fifth-seeded Eagles caught a providential break last week when regular-season champion Idaho was forced to “host” the tournament in Cheney because its own pitch was waterlogged. Eastern took it from there, blanking Montana and Idaho by 1-0 scores to reach Sunday’s final in front of almost a thousand fans. That seemed to energize the Eagles (14-4-3), who dominated third-seeded NAU in the first half. The first 30 minutes were more of a siege than a soccer match, as Eastern hit the crossbar once and narrowly missed the final touch on several good crosses. NAU’s only chances came on counterattacks, but the Lumberjacks made the most of them in the 35th minute. As Anna Goebel dribbled across the Eastern goalmouth, she was pulled down by EWU’s Megan Spataro just inside the penalty box. Al Lixandru converted the resulting penalty kick, leaving the Eagles with a 10-1 shot advantage with nothing to show for it except for a sense that good things were sure to follow. Sure enough, Eastern needed just three minutes to get the equalizer off a corner kick from Williams. The ball fell into a crowd in front of the goal, and midfielder Jenny Chavez right-footed it into the net from 10 yards out. “It was a scrappy goal,” Bodnar said. Eastern continued to force the pace through regulation and two 10-minute overtimes. The statistics were staggeringly onesided, with Eastern holding a 22-4 advantage in shots and 7-3 in corner kicks. The Eagles had several near misses late in the match, including a cross from Aimie Inthoulay that glided inches from Williams’ outstretched foot in front of the NAU goal. “We didn’t play that well in front of goal, but we created a lot of chances and put a lot of pressure on them,” Bodnar said. The Eagles kept up the pressure in the penalty-kick shootout, as Taylor dived to her left to save the first NAU kick. Chavez, Williams, Laci Rennaker and M’Kenna Hayes made their shots to give the Eagles a 4-3 lead after four rounds. That left Lixandru needing to make her shot to keep NAU alive, but her shot sailed over the crossbar and the celebration began. Published: Nov. 6, 2016, 11 p.m.